As insureCOURIER are part of The County Group, we are celebrating further expansion hot on the heels of scooping a major industry award. We acquired NMJ Insurance Brokers Limited, a £7.5m GWP broker with sites in Glossop, Scunthorpe, Belper and Bakewell on October 2nd 2017, bringing our total number of branches to 25 across the country. This summer we were named Insurance Broker of the Year at the British Insurance Awards after demonstrating first class customer service across our personal and business insurance product lines. CEO Dave Clapp, his Deputy Alastair Christopherson and Chief Sales Officer Kevin Catterall accepted the award at London’s Royal Albert Hall before a crowd of more than 2,000 guests drawn from the industry. NMJ Insurance, offers personal and commercial insurance products, and adds to a rapidly expanding portfolio for The County Group which started as a small high street broker in 2003 and now handles more than £80m worth of client premiums. Our other recent acquisitions have included Arthur Marsh, a large commercial broker based in Birmingham and Thompson Brothers located in Stockport, both offer personal and commercial insurance services. 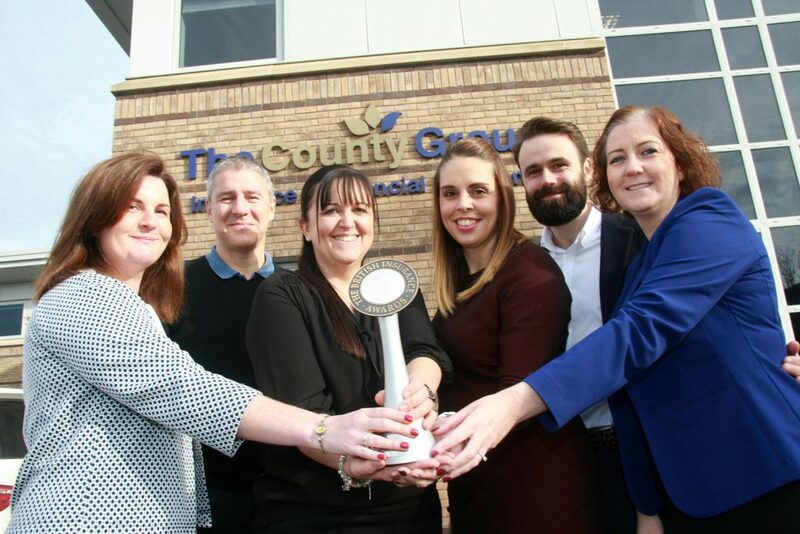 The County Group has won ‘Large Business of the Year’ at the South Cheshire Chamber of Commerce Business Awards on two occasions and is the current holder of the title. A move from Fourth Avenue in Crewe to a 10,000sq ft head office on Westmere Drive last summer has seen the local workforce swell to more than 100. Community broking and investing in local clubs and charities plays a key role in our business activities. The County Group logo is a familiar sight with football fans as sponsor of Nantwich Town FC this season.